He endured being called a girl, playing sports with waist-length hair and attracting disapproving looks from adults — all for a child in need he’s never met. 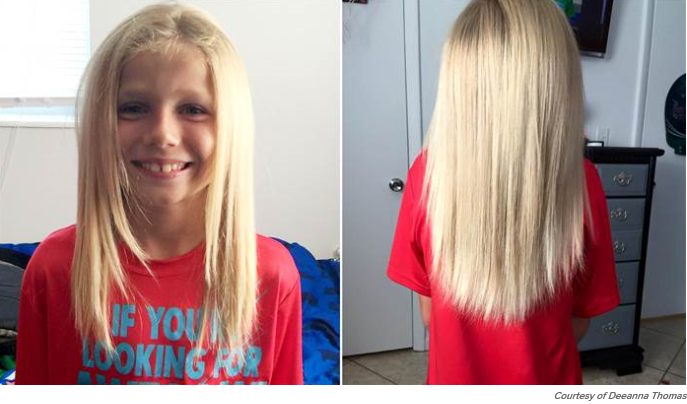 Eight-year-old Christian McPhilamy grew out his blond hair for more than two years so he could donate it to kids who have lost their locks. The mission ended with success last week after an epic haircut. His mom Deeanna Thomas is still awed by his determination. “It’s definitely inspiring to see kids starting so young with wanting to help and do good deeds,” said Christine Wong, COO of Children With Hair Loss, the charity that received Christian’s hair. Wong estimated only 1 in 50 donations to the organization come from boys. It all started during Christmas of 2012 when Christian saw a commercial for St. Jude’s Children Research Hospital. The TV spot featured young cancer patients without hair, which piqued his curiosity. Christian and his mom have a nightly ritual where they take an iPad and search for whatever fascinates him on Google. He’s usually interested in animals but that night, Christian looked up St. Jude’s. When an ad for a hair donation charity popped up, he asked Thomas what it meant. She explained to him people can donate their locks to cancer patients who have lost theirs due to chemotherapy. At the time he had a short spiky do, but with his mom’s OK, Christian began growing out his blond hair. The taunts and comments started when it got below his chin. “Sometimes they would call me a girl,” Christian told TODAY Parents. “Even out and about or at a park, he would be playing with a bunch of boys and they’d be like, ‘You look like a girl.’ And he would just explain to them. 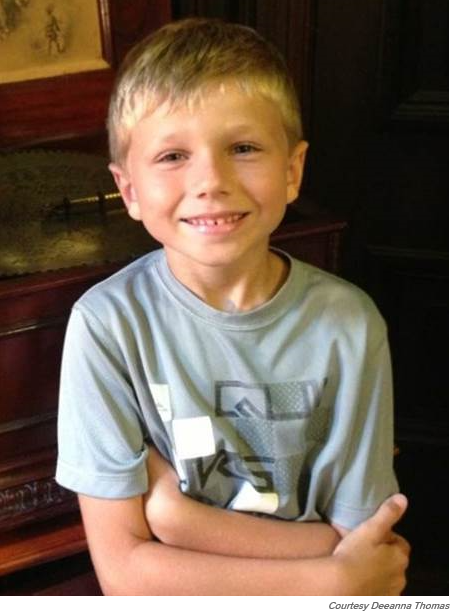 He held his head high and he never once said that he wanted to cut it off ever,” Christian’s mom added. One man bluntly told Christian his hair was getting too long and he needed to do something about it, but once he found out about the boy’s mission, he offered a heartfelt apology, Thomas said. Even though he seemed unfazed by the comments, Thomas still always tried to reassure him. “I just told him, buddy, if you’ve got goals and you want to reach them, you have to follow them. You can’t let what anybody says to you bring you down, and he never did,” she said. Christian’s hair grew well down his back, but he would only wear it down despite heavy encouragement from Thomas to put it up. The big haircut day finally came last Wednesday, as the family gathered in Christian’s room and his mom took scissors into her hands. With his thick hair partitioned into pony tails, the two-and-a-half-year-mission produced four 10-inch long sections that the family sent to Children With Hair Loss. The charity provides free wigs to kids who have lost their locks for any reason, including cancer, alopecia and burns. As for Christian, he said it feels good to have short hair again. Somewhere, another child will be feeling good, too, because of Christian. He is just like my son. But of course, not with the hair. Since the first grade, he loves to make mini-pouch with me and donated this at the orphange. He was so determined that he made up to a few hundreds every year. He made it whenever he has the time after the school for he saw that I did a few things for charity work. And now, he is in the fourth grade and still doing the same thing and still wanting to continuing doing it. So proud of my boy! Christian deserves a trophy for this! THUMBS UP! So proud of you, too. Wise beyond his years…lovely story. He is an inspiration. God bless him! What an awesome thing to do. Not only was the boy determined and focused on his goal, he continued to educate others around him. Amen for him! So inspiring! 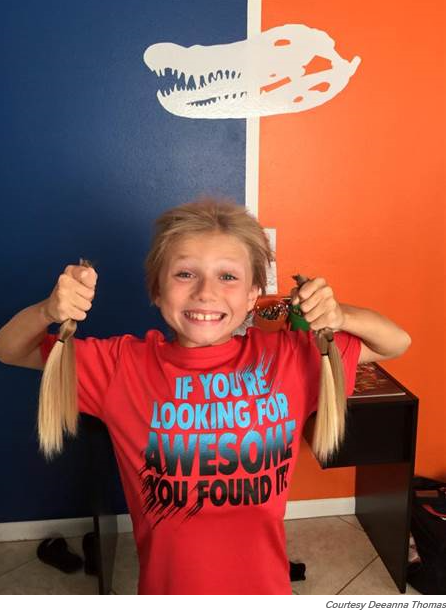 I have nieces who’ve donated to Locks of Love, but for a young boy to do so is a challenging commitment. The kid is a real hero!